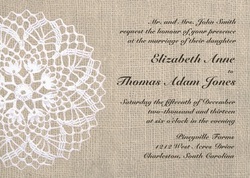 A vintage inspired wedding invitation with a background with the look of craft paper. An elegant image of an antique doily is printed along the side. Click below for customization and product pricing. Want a Different color or layout? • High quality, full-color, full-bleed printing on both sides. BASIC: A crisp professional paper with a smooth matte finish designed for vibrant full-color printing. 110lb cover-weight. 50% recycled content (10% post-consumer and 40% pre-consumer waste). eco-friendly choice for any invitation or announcement. LINEN: An elegant paper made with beautiful linen texture of embossed lines and a matte finish. 90lb cover-weight. 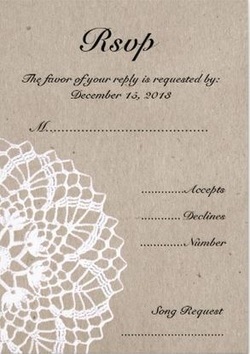 Perfect for wedding invitations and most formal occasions. FELT: A warm, buff-toned paper featuring an embossed finish that feels just like fine art paper. 100lb cover-weight. 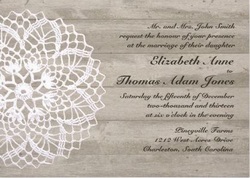 Perfect for wedding invitations or party invitations. METALLIC: A shimmery paper featuring a distinctive tint and smooth finish. 110lb cover-weight. Perfect for adding a bright shine to your invitations and announcements. Please visit our Frequently Asked Questions page. If you can't find the answer you are looking for, please Contact Us!